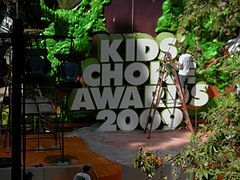 The 22nd Annual Nickelodeon Kids' Choice Awards was held on March 28, 2009, at 8 p.m. on the Nell and John Wooden Court of Pauley Pavilion. Dwayne Johnson hosted this awards show which lasted for more than one and half hours. Voting commenced on March 2, 2009. Performers and presenters have been listed at the official site. The Jonas Brothers sang their song, Lovebug, but changed the line "catch this lovebug again" to "catch this slime time again". By the end of the program, they were named the "slime gods". This year marks the last time that the Nickelodeon Orange Blimp was used on the Kids' Choice Awards logo for 4 years. The Nickelodeon Blimp was not used on the Kids' Choice Awards logo again until 2013. 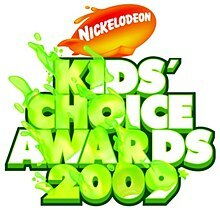 This is the last Kids' Choice Awards to air featuring the former Nickelodeon logo before it was changed later in 2009. According to Nickelodeon, the show was broadcast in more than "228 million households across Nickelodeon's 50 channels in Europe, Russia, the Middle East, Asia, Australia and Latin America." It had 7.7 million viewers. More votes than ever were cast for this year’s KCAs. A record 91.1 million votes were cast on Nickelodeon websites. Prior to the live telecast, Lily Collins, Pick Boy and JJ hosted the "orange carpet", featuring celebrity interviews and a live performance by Miranda Cosgrove outside Pauley Pavilion. Jonas Brothers – Main program "SOS"/"Burnin' Up"
Pussycat Dolls – Main program "Jai Ho! (You Are My Destiny)"/"When I Grow Up"
Justin Timberlake – Taught Dwayne Johnson how to dance (in a commercial). Jesse McCartney – Opened the doors for Dwayne Johnson. Miranda Cosgrove – Helped Dwayne Johnson get the codes and helped him get the blimps (in a commercial). Tom Kenny – Told Dwayne Johnson he had to find a key to unlock the slime. Jonas Brothers – Revealed as the "Slime gods" who cause them to become slimed. Bessie Higgenbottom (voiced by Amy Poehler) from The Mighty B! Chris Brown was nominated for Favorite Song and Male Singer but was removed from the voting, due largely to his altercation with Rihanna in February. ^ a b c d "Nickelodeon Kids' Choice Awards 2009 Press Kit". Viacom International. January 9, 2009. Retrieved August 21, 2009. ^ a b c "2009 Presenters/Performers Release". 2009 Kids' Choice Awards website. Viacom International. February 25, 2009. Retrieved August 21, 2009. ^ Robert Seidman (March 30, 2009). "The Penguins of Madagascar draws 6.1 million viewers Saturday night". Retrieved August 21, 2009. ^ "2009 Winners Release". 2009 Kids' Choice Awards website. Viacom International. March 28, 2009. Retrieved August 21, 2009.